Kent coach Jimmy Adams says clinching their first win of the County Championship campaign will give them something to build on. 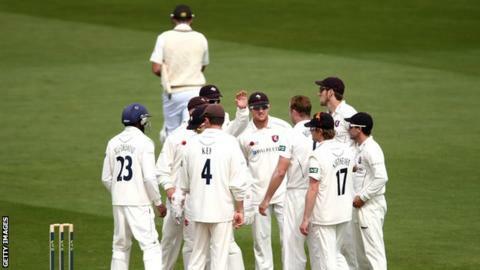 Kent beat Surrey by eight wickets on Wednesday after a defeat and a draw in their first two games. "Once you get the first one out of the way we can reflect and say where we were strong," he told BBC Radio Kent. "We can start emphasising that and it is great we can have that benchmark and yardstick to measure yourself against." Kent skipper Rob Key and Brendon Nash both made centuries against Surrey while young spinner Adam Riley took match figures of 9-155, and Adams was impressed by their all-round team performance. "We had a really good effort from everyone in pre-season and came in confident but you still need that first win," 46-year-old former West Indies Test player said. "We got it on the back of some really good individual performances but also collectively as a unit. "We gelled well and played well for each other. "It is the first time this season we have seen batting and bowling partnerships consistently over four days. "We are striving to become a consistent team and we saw signs in this game of what is possible. Hopefully we will keep getting better and stronger in these departments." Kent's next match sees them travel to the Midlands to face Derbyshire in a game beginning on Sunday. "We have a few days to reflect on this game and think about what the conditions might be in Derby," Adams said. "It might be a case of travelling with 13 but I can't see the nucleus of the team being much different. "The lads are in a good place and I'd like to think these lads would be keen to build over what we have done against Surrey."